I am often fearing that each time I review a movie from the Marvel Universe series that they are getting almost as repetitive as the movies themselves. In truth, there are only so many ways to rephrase my opinion that, while the movie is okay, I feel like I'm watching the same thing over and over again. It is for that reason I was really looking forward to seeing Spider-Man: Homecoming. 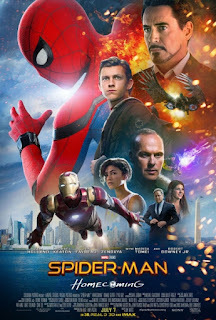 The first two Sam Raimi directed movies were pretty good, even if the third was a silly mess that, instead of getting a chance for redemption, ended prematurely, with Andrew Garfield replacing Tobey McGuire in the role and beginning, again, with the origin story. The Amazing Spiderman movies represented some of the worst handling of a superhero franchise, and a third movie was ultimately scrapped. While the Marvel Universe has had its ups and downs, the DC Universe has largely languished in a series of awful, empty spectacle films. I have to admit I have largely avoided seeing many of their films just simply because I don't purposely seek out bad movies just to torture myself so I can write a snarky review. I honestly watch movies hoping that I will enjoy them, which is why so many of my reviews tend to the positive. I see no reason to slog through something like Suicide Squad to be the umpteenth person to verify that, yes, it's terrible. Despite the poor quality of the other DC movies, Wonder Woman was hailed as the shining exception. Patty Jenkins's film got the MRA trolls all up in arms just simply because it existed, while the contingent of critics that thinks even the lightest of box office fluff must have some sort of progressive political content hailed it as if no movie in the last century had ever had a strong female lead. 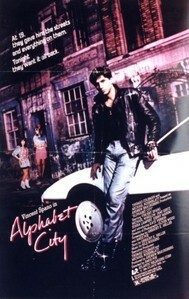 I know about as much about Vincent Spano as I do about Alphabet City itself in the 1980s. 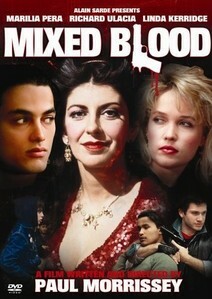 I largely decided to watch this since I recently reviewed the Paul Morrissey movie Mixed Blood, which was filmed in the Lower East Side neighborhood itself in the same time period as both of these movies are set. I assume, with the dilapidated buildings and urban wasteland, that a good portion of this was filmed there as well. Amos Poe, whose biggest claim to fame at this point was the 1976 film The Blank Generation, which introduced the world to New York City's punk scene, is definitely no stranger the environs. Still, the movies couldn't be more different in tone and feel. In many ways I was wondering just what type of film Poe was trying to make. Here is an element of truth: except for some of the obvious movies, or ones that I pick out specifically because they have not yet been reviewed on his site, I often have no idea about a movie before I choose it for review. I typically check out the blurb to make sure it's a format that fits my blog, and that's really about it. Typically when the movie starts playing, or I look up some info right as I'm starting it, I get surprises - and not always good ones. But, by that time, I'm committed. Paul Morrissey is not one of those directors I specifically seek out. I largely know him from his two '70s Andy Warhol funded horror films, Blood for Draculaand Flesh for Frankenstein. Both had their good points, but they were over-the-top camp. It was really hard to take much of it seriously, which I think was largely the point. I really never had much desire to check out anything else Morrissey did.